Saving farms and farmland is more than a once-a-year consideration for our supporters! 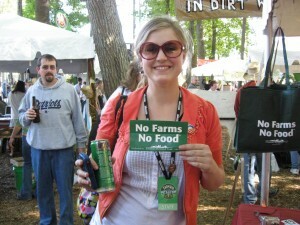 American Farmland Trust fans are creatively engaging others to save the land that sustains us by bringing the No Farms No Food® message to their friends and sharing their commitment to America’s farms. You can pass on the gratitude by collecting tips in the name of farms and farmland. Meet Janine, who donated her tips to American Farmland Trust while serving local farm goods to an enthusiastic crowd. Do you have a great idea of how you can pass the gratitude? Tell us what you plan to do. 2. Build on the farm and business connection. Did you know that every time a farm goes out of business, it has an impact on the local economy? Help us grow our list of partners who support a more sustainable future for farms. Whether you are a small business owner or you work for a farm-friendly company, consider setting up a marketing partnership with American Farmland Trust. Cool companies like Peeled Snacks out of Brooklyn, New York, have sponsored our work to spread the No Farms No Food® message. 3. Solicit donations through a social sale. Who hasn’t enjoyed a relaxing day socializing while hosting a good old fashioned bake sale or garage sale? Host a “social sale” in your community or online like Purely Elizabeth did with her cool cookie business. If your sale raises more than $100, we will feature you on Farmland Report and in our newsletter. Tell us what you plan to do. 4. Spread the word about our work to save farms and farmland. Every minute, we’ve been losing more than an acre of farmland. Once a productive farm is lost, it’s usually lost forever, and the ripple effect can be tremendous. Writer and author Betty Londergan was inspired by our mission to save farms; and helped us grow our membership by donating $100 and then solicited matching gifts from her followers. Use our press kit to engage your community in saving farms. Whether you love riding your bicycle, jump roping, horseback riding or running, you can raise money by getting others in your community to help raise funds for American Farmland Trust. All you have to do is pledge to spend a day doing what you love, while supporting a cause! Be sure to tell us what you are doing to support American Farmland Trust. If you can raise $250 – we will send you a No Farms No Food® hat. This entry was posted in Local Farms and Food, Uncategorized on February 24, 2011 by admin.